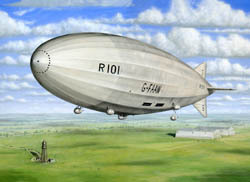 This is a list of the Feight Studios giclee and lithograph prints of the various non-military aircraft subjects produced at Feight Studios over the years. The famous deHavilland DHC-2 Beaver flying over a group of whales in the southeast area of Alaska known as Glacier Bay. A Beechcraft V-Tail Bonanza flies over a scenic vista of rugged mountains, forests and trees. Jon Sharp's record breaking Formula One race plane. 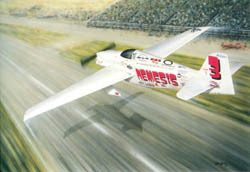 Winner of many Championships at the annual Reno air races. 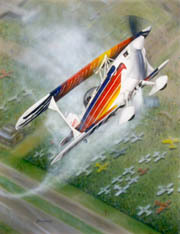 The late Charlie Hillard performs a torque roll in his famous Christen Eagle during one of the many airshows performed by the Eagle's flight demonstration team. 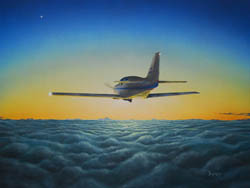 Stoddard Hamilton Glasair RG flying VFR on top into a beautiful sunset. 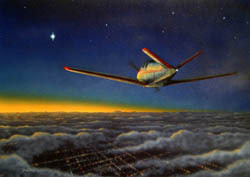 "A Date with the Prince"
1949 Beechcraft v-tail Bonanza flies into the night towards the fading sunset. We appreciate your interest in Feight Studios and hope you enjoy your tour through our website. Secure PayPal online ordering is available just click the "Add to Cart" button. If you have any suggestions, comments or questions just send an email to the artist at don@feightstudios.com.